To speak to Dr James Borthwick's secretary, please phone 03 281 8357.
advanced vitreoretinal surgery, medical conditions of the retina and refractive cataract surgery. For fifteen years, Jim practiced as the only vitreoretinal surgeon in the South Island. He consults here at Southern Eye Specialists, which is well equipped to test and examine retinal disease. For specialist complex retinal surgeries Jim operates at Christchurch Eye surgery. Jim has great interest and experience in cataract surgery, including correction of astigmatism and using multifocal lenses to give the best results in distance and reading vision. Management of macular degeneration and other retinal conditions is his other specialist interest. He has extensive experience in the use of intravitreal anti-VEGF injections, including Avastin, Eylea and Lucentis. He is also the only provider of Visudyne photodynamic therapy and nanosecond laser In the South Island. As well, Jim conducts international clinical trials in retinal research for macular degeneration at Southern Eye Specialists. 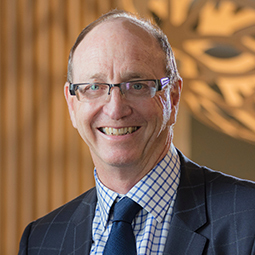 Jim is a Fellow of the Royal Australian and New Zealand College of Ophthalmologists, and also a Council Member of RANZCO, and previously the Chair of the New Zealand branch of RANZCO.